A local purveyor of yummy yuppie beverages is planning to see how honest Washingtonians are -- or aren't. Honest Tea is "conducting a social experiment" with unmanned booths at Union Station and other spots this week. 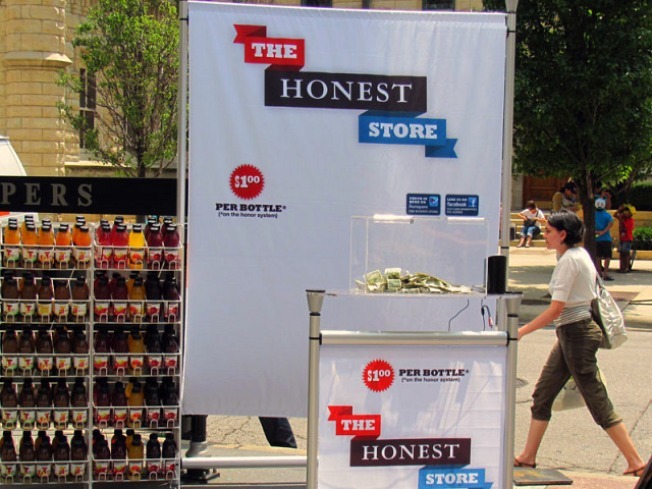 The Honest Store will be "selling" bottles on the honor system. Each drink costs a dollar, but it's up to each would-be shopper whether they actually pay. Hidden cameras will record the comings-and-goings, but there's no punishment for not paying... other than one's own guilty conscience, maybe. Of course, now you're in on the secret. They could probably get the same effect -- without the Eye of Sauron issue -- simply by counting the bottles ahead of time and subtracting the number of dollars received. But where would be the fun in that? 18th & K streets N.W. 7th & G streets N.W. You'll also find an Honest Store will be at Union Station on Thursday, July 15 starting at 7:30 a.m.
And it's not only happening here. The honesty of several other major cities is also being tested. So far, Boston was 93.3 percent honest, while Atlanta and New York were 89 percent honest. Proceeds from the Honest Stores will be donated to City Year, which helps young people offer a year of service in schools and communities. See, it's for a good cause. Pay your dollar. Or at least don't blame us when you can't sleep at night.